The National Veterans Memorial and Museum offers a unique experience that is unparalleled. Our mission is incorporated throughout the museum and in our community by highlighting the contributions of veterans to our free and safe democratic society. Our goal is to inspire NVMM visitors of all ages to learn more about our country’s history and to actively engage in their own communities. As we continue building upon our strong foundation, we invite you to be among the first to support the NVMM in our inaugural year and learn more about how you can participate in this historic effort. 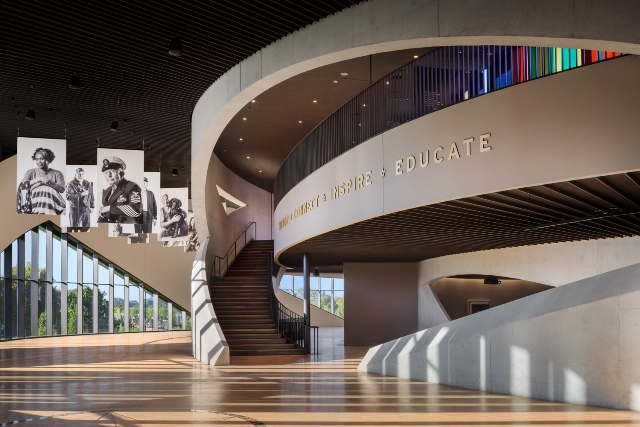 Whether it is through support for The Honor Fund, capital projects, world-class exhibits, preservation of artifacts, important scholarship or public programs, your impactful donation will enhance our amazing visitor experiences. Gifts to the NVMM are 100% tax deductible. Additionally, to learn more about sponsorship and membership opportunities please contact Nick Wood at 614-427-1089 or by email at nwood@nationalvmm.org. Please note, the National Veterans Memorial and Museum is not a collecting institution, and is not able to accept donations of artifacts at this point in time. All artifacts featured in the museum are curated through a loan process, mostly from lending institutions. You can learn more about the artifact loans process here.